FIND YOURSELF ON JUNE 29TH @ CASA TWICE. Thursday June 29 from 6 to 8pm. SOCIAL. FREE. REFRESHMENTS. LIMITED QUANTITY OF SIGNED BOOKS FOR SALE. 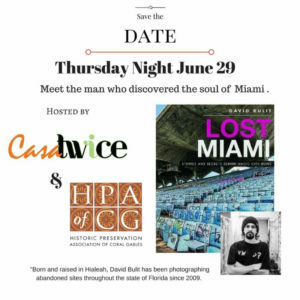 Author/photographer David Bulit will be presenting his book “Lost Miami” and a few selected photographs to display. Below is link to article about book.